I usually don’t write book reviews. In fact I did only once. It was a chore, but I did it because I felt the review was worth my and your time. This is another one of those rare instances. In this case, I have been looking for a book or resource that emotionally connects me to global warming and empowers me with practical steps to do more through design. 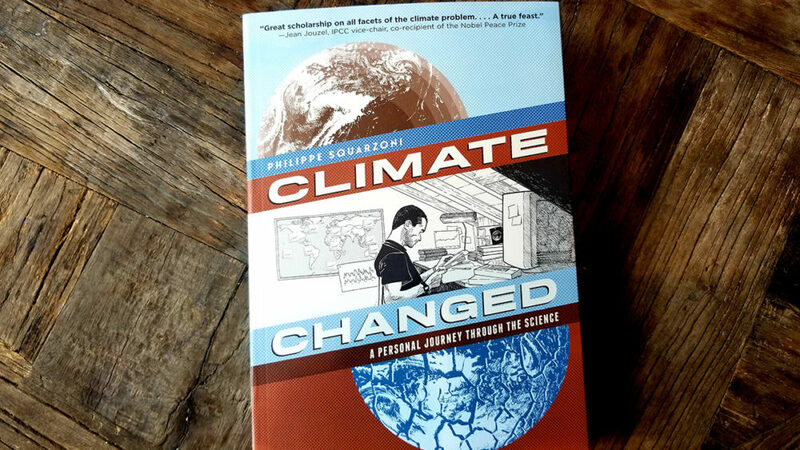 On a recent lazy weekend Amazon book search, I stumbled upon the graphic novel “Climate Changed: A Personal Journey Through the Science” by Phillipe Squarzoni. The graphic novel was originally published in French in 2012, and then in English in 2014 by Abrams ComicArts. It’s a big book (500 pages) and probably killed a lot of trees – which I thought about as I read through it. The central theme of the book, however, is when faced with the perilous facts about global warming, what should you do? 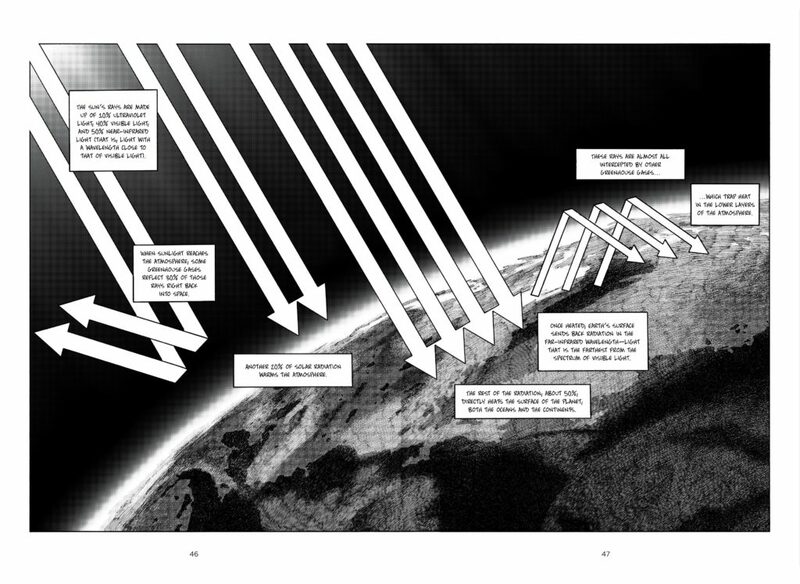 Is writing and illustrating this tome of a graphic novel ok if people collectively step up and vigorously reduce their greenhouse gas (GHG) emissions? Do the ends justify the means? I assume, despite the tree issue, Squarzoni felt so. Squarzoni and his partner are the two central characters of the story in which Squarzoni researches global warming to write a small section of a book he’s working on. 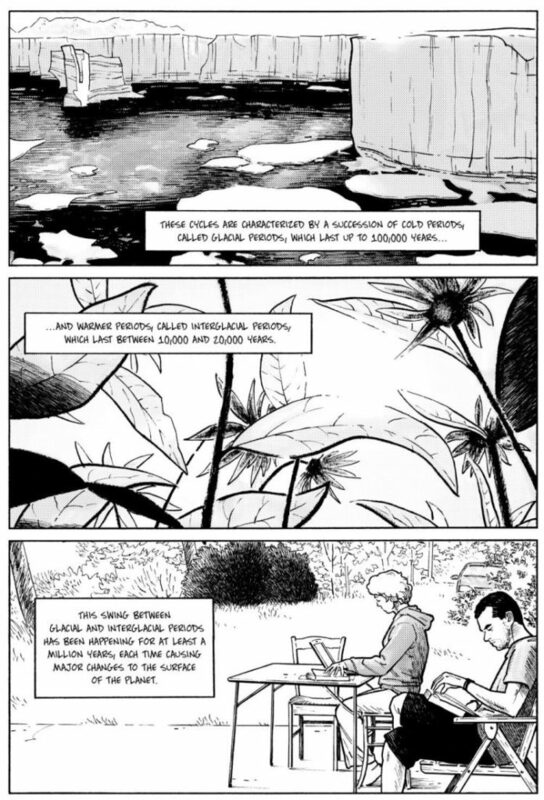 After what he discovers in his research, he decides to turn the graphic novel project into their own personal (but really universal) journey struggling with their own carbon footprint and what they really can and should be doing to live a life they want to lead with and without the added guilt of what the impacts of their life is and will be. Yes it is very meta. The graphic novel was beautifully written and drawn. The thoughts and illustrations of Squarzoni and his partner were near mirrors of my own. For instance, in the story, Squarzoni was invited on an all-expenses-paid trip to Asia for an artist residency. He wants to go as he’s always wanted to visit Asia and the residency would really help his career. But the statistics about carbon emissions from international travel combined with what science says a Western persons’ carbon footprint should be to avoid catastrophe, eventually scare him off from going. He felt he made the right decision, but afterward is frustrated as this really isn’t the way he wants to live his life turning down a great opportunity for the common good. He doesn’t know what to do. This style of honest storytelling resonated with me as I also feel guilty and sometimes hopeless wondering what I really can do to stop our climate from spinning out of control. I always think about global warming. I wonder if I’m doing enough to help reverse what’s happening. I know I am not in the end, but what really can I do? I see quotes that yes one person can change the world. I do believe them, but what if it’s only me alone that stops flying for instance? What really would that do? The plane will probably still take off without me. I won’t get to go places I have always wanted to visit, and since all my family is quite far away, I’ll never see them. This doesn’t sound like a fulfilling life decision, but it’s clear the rise in air transportation has added tons of Co2, nitrogen oxides (NOx), water vapor, particulates, and contrails to the atmosphere and that isn’t good. Air transportation currently accounts for 2% of the carbon emissions annually and is expected to double by 2035. Squarzoni also reflects a lot about his childhood throughout the story connecting it to the present dire climate situation. As a child, he saw the future as limitless, full of opportunity, and held the possibility to do anything. I think most of us can remember similar feelings as a kid. I consistently go back in my mind to when I was a kid to drawing in my notebook on the kitchen table, exploring the neighborhood on my bike, daydreaming about finding ancient treasures like Indiana Jones, and believing the future (although an unknown) wasn’t scary but fantastic. I remember my younger self because many days now I fear the future. That nostalgia seems like a safer place to be than the present. I am not sure the future will be fantastic and I worry my 9-year old daughter won’t have the same opportunities or security I had the privilege of having. I can’t stop thinking this way. Squarzoni made me feel like I am not alone in this. However, maybe I need counseling nonetheless. I escape to books, sci-fi movies (like Squarzoni), beers, and games where I try to enjoy the now without worrying about the future. It’s hard to do. It’s not easy to ignore what’s going on around you (especially in these troubling political times). I feel guilty because maybe I could be doing more. Re-nourish is one thing I do. Fresh Press is another. But are they enough? Maybe they should be more? I really don’t know. The book didn’t solve my own personal puzzles, but it made me feel that we’re all on this journey together. I felt connected. A minor positive, but one nonetheless. 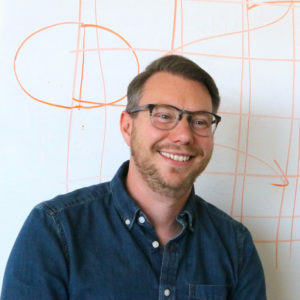 Squarzoni also gave me hope that more comics like his or design in general can connect emotionally with the public and create more discussion and hopefully thoughtful actions to reduce our GHG emissions. Outside of the personal connection the story had for me, the book does really a fantastic job of visually explaining what global warming is, what it impacts, and how we make it worse through our actions. Squarzoni does this through illustrated headshots of scientists he interviewed and information graphics explaining the science. I knew all of this science already, but the dozens of pages dedicated to the data really hit home more so than any scientific journal. 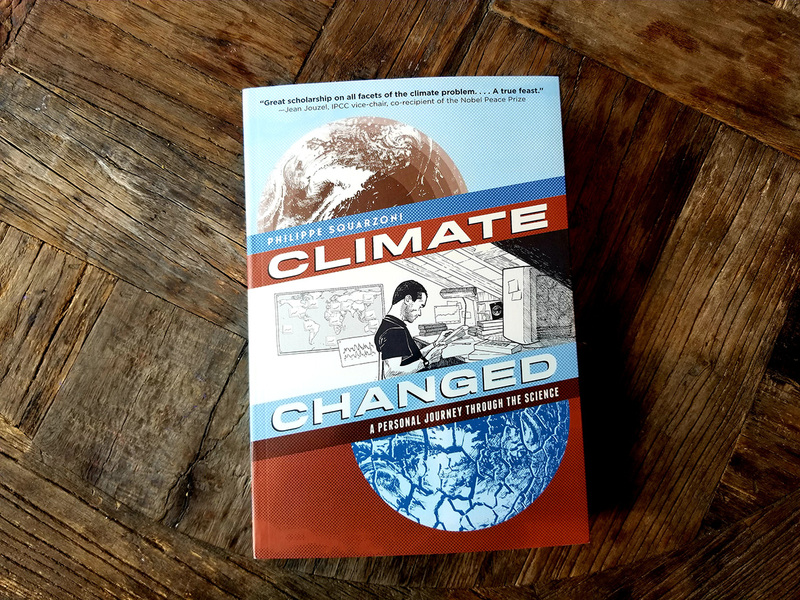 I felt that through the illustrations and lettering I not only understood what was happening and could occur with our climate, but I was emotionally part of it. It gave me many ideas to bring into the design classroom and this site Re-nourish. Squarzoni also made me wonder if comics were a better way to communicate the data and scenarios in the climate science journals to the masses. Dr. Damian Duffy (University of Illinois) agrees in his PhD dissertation. Comics are more approachable than a journal and can more easily present challenging information visually in smaller chunks that are easier to understand. I have hope everyday, for my daughter’s and her generations’ sake, that our limitless imaginations can find a way to work together to reverse global warming. There are indeed, other people who agree with me too. And in reality, that’s we need. We need each other.